Mark Zuckerberg teased the introduction of 360-degree video during his keynote address at F8 in March, and now, it’s no longer a tease. Facebook co-founder and CEO Mark Zuckerberg teased the introduction of 360-degree video during his keynote address at F8 in March, and now, it’s no longer a tease. Creators use special cameras to capture all 360 degrees of their subject matter, allowing users to choose their viewpoints by dragging the videos with their fingers on their mobile devices or shifting the devices themselves. The initial group of publishers of 360-degree videos was made up of Star Wars, Discovery, GoPro, LeBron James & Uninterrupted, Saturday Night Live and Vice. Video publishers looking to enter the fray can click here for more information on how to get started. Today we’re launching 360 video on Facebook. Starting very soon, anyone will be able to upload 360 video, and if you’re on a desktop or Android (or an iPhone in the coming months), you can pan around the video while it’s playing in your News Feed. On the phone especially, slowly turning around and tilting your device up and down to watch a scene as it’s playing is a really cool experience that takes you somewhere else. It’s the kind of thing that you run over to show someone else the moment you first see it. 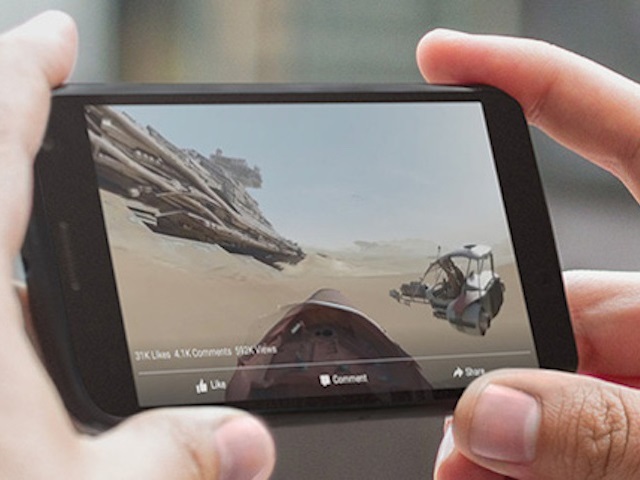 To showcase the technology, Disney is releasing a brand new, exclusive 360 experience for the upcoming Star Wars film today on Facebook, which will allow viewers to explore the planet Jakku while traveling on Rey’s speeder. I’m embarrassed to say I don’t know what that means, but we are honored to have such a legendary launch partner. A bunch of great partners have come up with really interesting takes on what can be done with 360 that are also launching today—shark diving with the Discovery Channel, on the set of the 40th anniversary of SNL, on-the-ground reporting in Afghanistan from Vice, motocross riding in the Idaho desert with GoPro, LeBron James taking you inside his training routine. It’s an open-ended format, so we’re really excited to see what creators around the world come up with as they get their hands on it. There’s a whole world of publishers and storytellers who are at the cutting edge of innovating with this immersive and interactive medium. If you’re a publisher developing 360 videos, we hope you will share your creations with your global audience on Facebook. We can’t wait for people on Facebook to explore new perspectives and experiences through the eyes of innovative publishers, right in News Feed. We believe in the future of virtual reality, and with 360 video, we hope to unlock new perspectives and immersive storytelling for everybody. To create 360 videos, a special set of cameras is used to record all 360 degrees of a scene simultaneously. This means that when the video is playing on Facebook, you can choose what angle you want to see it from. On the Web, you can do this by dragging around the video with your cursor, and on mobile devices you do it by dragging with your finger—or even just by turning your device. You’ll be able to hold up your phone and the 360 video will follow you as you turn, looking around, to experience things from all over the world like never before. In the future, imagine watching 360 videos of a friend’s vacation to a small village in France or a festival in Brazil—you’ll be able to look around and experience it as if you were there. Along with updates from your friends and family, you will also be able to discover amazing new content on Facebook from media companies, organizations and individual creators. Readers: Are you excited about Facebook’s introduction of 360-degree videos?